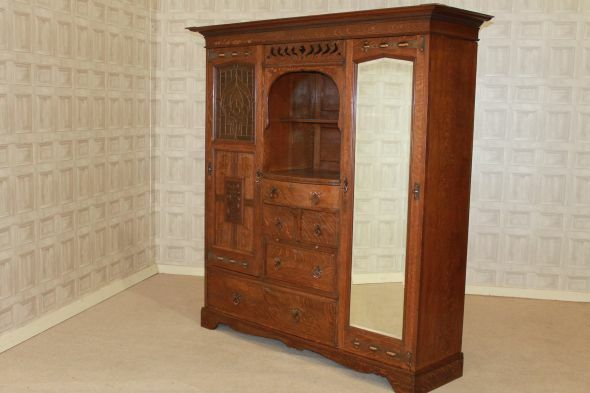 A magnificent piece of solid oak arts and crafts furniture; this wonderful item boasts a large out swept cornice, and a multi drawer centre section which includes small pull out brush slides. This is flanked by mirrored and glazed doors which open up to reveal internal hanging space. The wardrobe breaks down into 4 individual sections for ease of transportation and reassembly. This lovely item is in excellent condition for its age, which we believe to be circa 1900. There is a small pane of glass which is broken; this is clearly displayed in the photos. However this is just a small crack and is insignificant. We feel that to have this repaired would cause more damage to the lovely glazed window. This beautiful piece of furniture would be a fantastic addition to a large bedroom setting, or equally a stand-alone piece to grace any traditional style property. Please note, the other items pictured are not included in the listing but can be purchased separately.